Hello and welcome to another Runway Inspired Challenge. This is challenge #89 with outfit from Chirstian Siriano. This challenge is sponsored by FishScraps – digital art for creative people like YOU! Carrie generously provided us design team with her gorgeous digital arts to use. If you love digital stamps and images, then check out FishScraps. 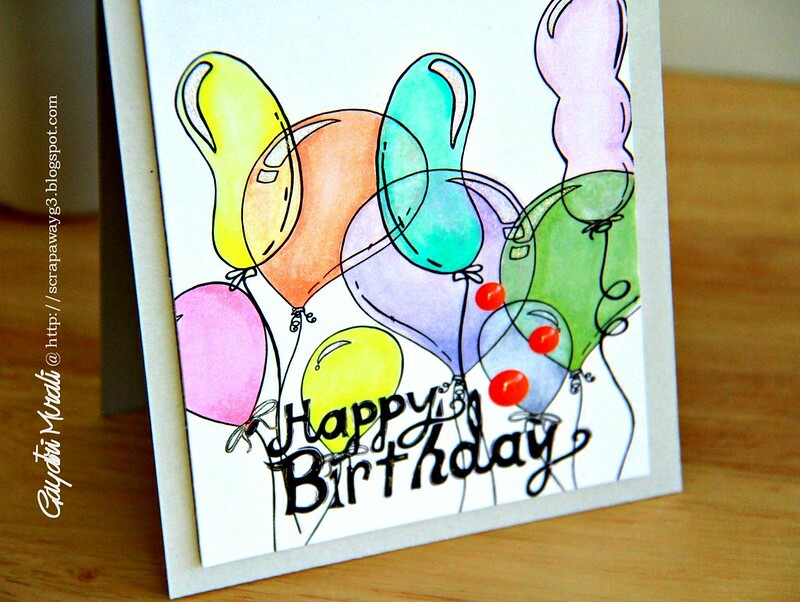 Carrie has really beautiful and fun line arts as well as gorgeous pattern paper. One of my favourite digis. Love it! I made two card for the challenge. I just took the coloured from the outfit and the photo as a whole and incorporated them into my projects. This is my first card. The balloons are from Birthday Balloon clipart, which I layered using photoshop and also added the sentiment from the same line of clipart. I then printed the image out and coloured the balloon using the colours from the inspiration photo for the challenge. I trimmed the card panel down and adhered on a grey card base. I then added bright orange dots picked from the shoes of the photo inspiration. For my second card, I went a bit elaborate. But first here is the card. 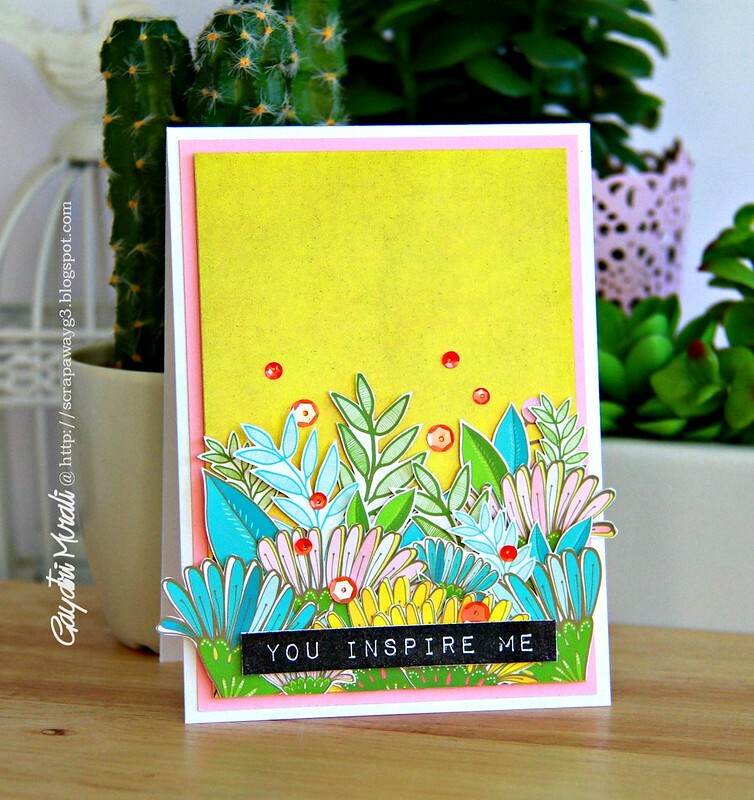 I used the paper and elements from a value bundle of Wild Flower Combo, Country Flowers, Shabby Chic Floral, Vibrant Teen and Graphic Design Bundle. Again, I used photoshop to resize the pattern paper, the flowers and leaves, printed them on cardstock at Office Works. I them hand cut out all the flowers and leaves to cluster glue them on the green printed cardstock. Here is a closeup. I then matted this panel on a pink cardstock before I adhered the panel to the white card base. 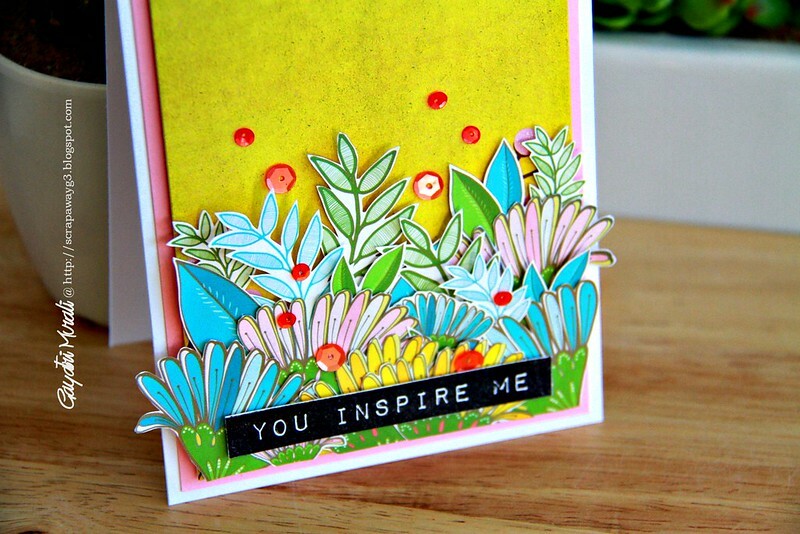 The sentiment is from Altenew’s Label Love stamp set. Again I brought in the orange from the shoes into the card using Tangerine sequins from Pretty Pink Posh. Hope you like my take on the challenge using FishScraps digital art. Check out Runway Inspired Challenge for more inspiration on the challenge using FishScraps.